Looking for the best Fishing trails around Chanute? Find the top rated fishing trails in Chanute, whether you're looking for an easy short fishing trail or a long fishing trail, you'll find what you're looking for. Click on a fishing trail below to find trail descriptions, trail maps, photos, and reviews. Rode this trail from Iola to Humbolt and back, and then stumble on the single track trail outside of Iola. That was really nice too! We camped in Humbolt and that was disappointing with the noise from a local plant and the bathrooms were quite dirty. We took a ride from the trailhead at Princeton KS, about 17 miles to Garnett KS, where we ate lunch at a restaurant on the town square, and returned that afternoon. This trail has excellent surface condition, good vegetation control, safe bridges, and nice variety of scenery in open space and deep forest cover. Bathrooms and water available at Princeton, Richmond, and Garnett. Its a nice day trip from Kansas City to get out in the country. You want it? Lehigh's got it! 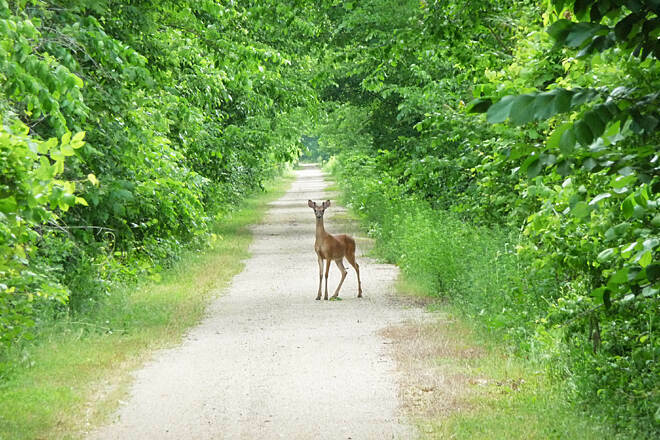 The Lehigh Trail, at the south edge of Iola, KS has something for everyone. The main trail offers a hard-packed limestone screening surface, firm enough for hiking, biking, wheel chairs, and strollers, and is an excellent surface for the casual hiker/biker. For those who want something more challenging, there are single-track trails over rocks, through wooded areas, through tall grass, and along the edge of its namesake rock quarry. Lehigh has it all! Plenty of place to stop and enjoy the prairie. We rode this from Riverside Park south for about 3 miles. It is a flat trail that is maintained pretty well. We enjoyed it, but it was right at sundown so we couldn't go any farther.. This is an amazing trail. VERY WELL maintained and very easy to ride. My friends and I rode this trail last week from Humbolt to Iola and from there rode the Prairie Spirit Trail on up to Colony where we had lunch. Then we rode back to Humbolt. I was so impressed, and it was so beautiful with the tree canopies and the big bridge. I am planning on coming back and bringing my husband so he can experience this beautiful trail too. I would give this trail 10 stars if I could. A nice, short, well-maintained, shady, paved trail that runs through residential areas in Pittsburg, KS. There are lots of street crossings, but most of the streets are quiet. Trailhead Park, at the north end, added in 2010, has a parking lot and water fountain. Because of the numerous street crossings it isn't conducive to fast bicycling, but it's a safe and pleasant place for a jog. I ran this trail yesterday and it was a good 1 hour round trip. It's well maintained; I did it using a gravel-oriented road bike (32 mm tires) and had no problems. It's scenic, with fields, forests, and streams, and abandoned railroad signal boxes. There is parking at both ends. We have ridden this several times. There is fee payment stations. 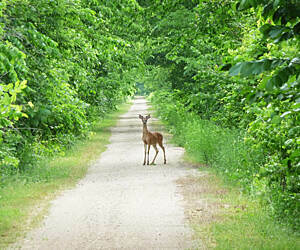 We have also ridden flint hill nature trail. That trail is free more like the KATY trail. So pick one that works best for your situation! I live in Iola and use this trail several times a week. Maintained very well.